I was inspired by a friend of mine to dust off my ice cream/frozen yogurt maker and try my hand at frozen yogurt. Initially I was going to make peach frozen yogurt with the fresh peaches I picked up at the farmer’s market last weekend, but my husband didn’t think that was a wise use of the bounty. So, I opted for mango and raspberries instead since I had both in my freezer that needed to be used. I forgot how simple it is to make your own frozen yogurt! And it is great to have control over the ingredients and know exactly what goes into it. Also, it is so much more economical than the FroYo places popping up all over and just as good. I foresee many more fun flavors this summer! While we all happily ate it up, I will continue to tweak my recipe. I’ve made notes below on what I will change next time. 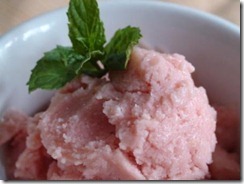 Put the fruit in a food processor or blender and puree until smooth. Add the rest of the ingredients and puree until blended and smooth. Put mixture into the frozen canister of the machine, following the instructions for your machine. After about 30 minutes of churning you should have delicious frozen yogurt! What are your favorite frozen yogurt flavors?